Please come and join us at this fun Irish pub located in Rice Village. Who is The Gorgeous Gael, you might ask: Jack Doyle was an Irish immigrant who became famous as a British heavyweight boxer, Hollywood actor and tenor. 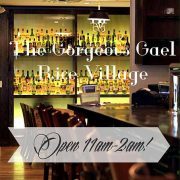 Now H-town brings us The Gorgeous Gael which boasts an impressive collection of Irish whiskeys and domestic/craft beers, and classic bar bites, and more much. A special feature for the evening will be ‘SPICY NUTZZ”, a cover band which plays rock music starting at 7 pm. Please RSVP and we look forward to seeing all of you, Venere, Shahla, and Michelle and EC family. Not signed up as a FREE member yet, please sign up: www.eurocircle.com? While logged on to FB, please go on and create an account with your FB credentials !